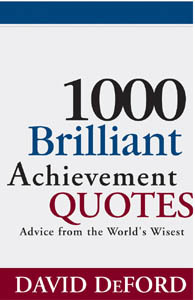 In this new book, you will find the best advice from the world's wisest people. We are frequently complimented for the quotes included at the end of each e-zine. Since the quotes have been among the most popular features of our publications, I decided to compile the best into one volume. I'll pay the shipping and applicable sales taxes. In honor of this publication announcement, this week's article is composed of a selection of them. "You don't have to be a fantastic hero to do certain things— to compete. You can be just an ordinary chap, sufficiently motivated to reach challenging goals." "Hoping and dreaming of a better world are not enough if we are unwilling to work; but when we work towards our dreams, wonderful things can happen." "The sweetness of victory is magnified by the effort it took to achieve it." "High achievement always takes place in a framework of high expectation." "Disciplining yourself to do what you know is right and important, although difficult, is the high road to pride, self esteem, and personal satisfaction." "The only worthwhile achievements of man are those which are socially useful." "Only if you reach the boundary will the boundary recede before you. And if you don't, if you confine your efforts, the boundary will shrink to accommodate itself to your efforts. And you can only expand your capacities by working to the very limit." "Unless you walk out into the unknown, the odds of making a profound difference in your life are pretty low." "The optimist sees opportunity in every danger; the pessimist sees danger in every opportunity." "Attitude is more important than the past, than education, than money, than circumstances, than what people do or say. It is more important than appearance, giftedness, or skill." "Attitude is an important part of the foundation upon which we build a productive life. A good attitude produces good results, a fair attitude poor results, a poor attitude poor results. We each shape our own life, and the shape of it is determined largely by our attitude. "People are just about as happy as they make up their minds to be." "Character is the result of hundreds and hundreds of choices you make that gradually turn who you are, at any given moment, into who you want to be." "Circumstances do not make a man, they reveal him." "Always be loyal to those who are absent, if you want to retain those who are present." "Principle--particularly moral principle--can never be a weather vane, spinning around this way and that with the shifting winds of expediency. Moral principle is a compass forever fixed and forever true--and that is as important in business as it is in the classroom." "Whether you be man or woman you will never do anything in this world without courage. It is the greatest quality of the mind next to honor." "No man can tell whether he is rich or poor by turning to his ledger. It is the heart that makes a man rich. He is rich according to what he is, not according to what he has." "Even as water carves monuments of stone, so do our thoughts shape our character." "In matters of style swim with the current; In matters of principle, stand like a rock." "A big man is one who makes us feel bigger when we are with him." "Not a day passes over the earth, but men and women of no note do great deeds, speak great words and suffer noble sorrows." "Be more concerned with your character than with your reputation. Your character is what you really are, while your reputation is merely what others think you are." "Show me a man who cannot bother to do little things and I'll show you a man who cannot be trusted to do big things." "Confronting and overcoming challenges is an exhilarating experience. It does something to feed the soul and the mind. It makes you more than you were before. It strengthens the mental muscles and enables you to become better prepared for the next challenge." "Show me someone who has done something worthwhile, and I'll show you someone who has overcome adversity." "The spirit, the will to win, and the will to excel are the things that endure. These qualities are so much more important than the events that occur." "Success is just a matter of luck-just ask any failure." "A leader, once convinced that a particular course of action is the right one, must....be undaunted when the going gets tough." "Develop the winning edge; small differences in your performance can lead to large differences in your results." "Make no little plans, they have no magic to stir men's blood and will not be realized. Make big plans; aim high in hope and work, remembering that a noble and logical plan never dies, but long after we are gone will be a living thing." "I have missed more than 9000 shots in my career. I have lost almost 300 games. On 26 occasions I have been entrusted to take the game winning shot . . . and missed. And I have failed over and over and over again in my life. And that is why . . . I succeed." "There are two ways to look at life and the world. We can see the good or the bad, the beautiful or the ugly. Both are there, and what we focus on and choose to see is what brings us feelings of joy or feelings of despair." "It is for us to pray not for tasks equal to our powers, but for powers equal to our tasks, to go forward with a great desire forever beating at the door of our hearts as we travel toward our distant goal." "Do not let the future be held hostage by the past." "I shall not remain insignificant, I shall work in the world for mankind....I don't want to have lived in vain like most people. I want to be useful or bring enjoyment to all people, even those I've never met. I want to go on living, even after my death!" “A man, as a general rule, owes very little to what he is born with – a man is what he makes himself." "No great man ever complains of want of opportunity." "Let us consider the nature of true greatness in men. The people who can catch hold of men's minds and feelings and inspire them to do things bigger than themselves are the people who are remembered in history. . . . those who stir feelings and imagination and make men struggle toward perfection." "He should sweep streets so well that all the host of heaven and earth will pause to say, 'Here lives a great street-sweeper who did his job well'"
"In essence, if we want to direct our lives, we must take control of our consistent actions. 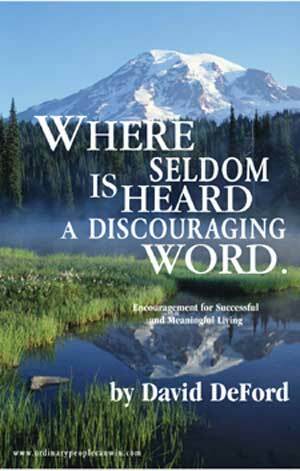 It's not what we do once in a while that shapes our lives, but what we do consistently." "A habit cannot be tossed out the window; it must be coaxed down the stairs a step at a time." "Happiness is not the result of circumstance. It is the result of loving others." "Happiness, it is said, is seldom found by those who seek it, and never by those who seek it for themselves." "Happiness is like a cat, if you try to coax it or call it, it will avoid you; it will never come. But if you pay not attention to it and go about your business, you'll find it rubbing against your legs and jumping into your lap." "I remember hearing in a talk that the more we express our gratitude to God for our blessings, the more he will bring to our mind other blessings. The more we are aware of to be grateful for, the happier we become." "You can make yourself happy or miserable - it's the same amount of effort." "It is not by accident that the happiest people are those who make a conscious effort to live useful lives. Their happiness, of course, is not a shallow exhilaration where life is one continuous intoxicating party. Rather, their happiness is a deep sense of inner peace that comes when they believe their lives have meaning and that they are making a difference for good in the world." "If you would find happiness and joy, lose your life in some noble cause. A worthy purpose must be at the center of every worthy life." 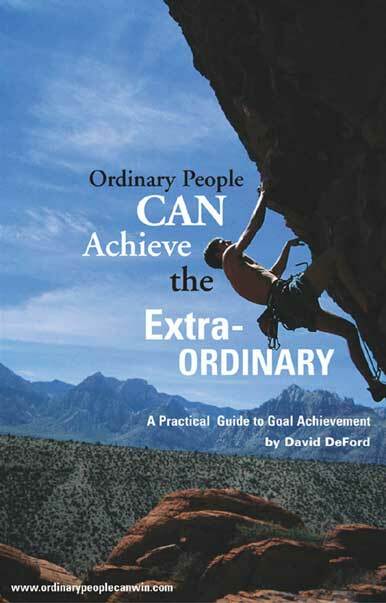 Ordinary People Can Achieve the Extraordinary-A Practical Guide to Goal Achievement will help you bust past the inevitable obstacles. In the past, you became discouraged and quit chasing your dreams.